Winner of a Books for a Better Life Award The inspiring and hilarious instant "New York Times" bestseller from the beloved parenting expert, public speaker, and founder of Momastery.com whose writing "is like a warm embrace" (FamilyCircle.com). Glennon Doyle Melton's hilarious and poignant reflections on our universal (yet often secret) experiences have inspired a social movement by reminding women that they're not alone. 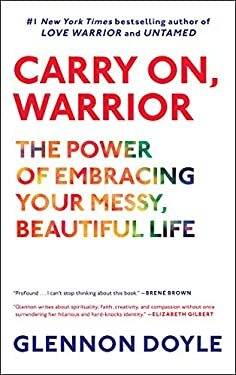 In "Carry On, Warrior," she shares her personal story in moving, refreshing, and laugh-out-loud-funny new essays and some of the best-loved material from Momastery.com. Her writing invites us to believe in ourselves, to be brave and kind, to let go of the idea of perfection, and to stop making motherhood, marriage, and friendship harder by pretending they're not hard. In this one woman's trying to love herself and others, readers will find a wise and witty friend who shows that we can build better lives in our hearts, homes, and communities.